The review is my personal opinion of the book. I received no monetary compensation for the book review. A copy of this book was provided to me for free for review purposes. I have removed essential steps and crucial ingredients from the spells and rituals performed in this story. This is not a textbook. The Darkness was written for entertainment purposes only. Do not, under any circumstances, attempt to cast spells or reenact ceremonies performed by these fictional characters. And that was before I even started the book. Whoa! A book with a warning? I knew this was going to be an interesting book. I was not even close. The Darkness is a mix of Sci-Fi, fantasy and horror with Christian beliefs and witchcraft thrown in. It is a fast paced book that should be read slowly so you have time to savor it. I am adding the book trailer here. It is a bit longer than most but well worth watching. I was blown away by it. This book takes what we know is happening with scientific experiments and mixes it with what we think may be happening and what we fear to imagine happening , especially in the hands of the military - any military. It will hold you in its grip until its unexpected conclusion. I say unexpected because of all the ways I saw this ending I had not come to the one given. Things I really enjoyed about this book were the respectful use of witchcraft. the very human people, the well developed characters, the fascinating story line, the mystery with which the author wrote. I had guessed the rituals and spells used would be somewhat realistic based on the warning but, having read other "magical" books, I was aware of what the reality could be. Happily the author stayed true and presented them as they are. Reading them I could feel the power and emotions in them. To be able to 'water them down' and have them mimic the actual ritual without losing the feel of them is an awesome talent. Kudos to Crystal Connor for mastering that. I really loved the way she let us into the hidden emotions. I do not want to give away too much of the book but there is a lot of realistic emotions put into her "villains". You really do not know whose side to be on. 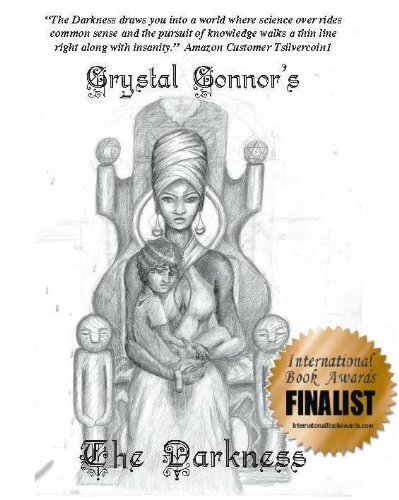 The author really does an excellent job at bringing out the dilemma of Solomon and the two mothers. The story line I found to be somewhat fresh and unique. The author took something familiar and added a twist that I have not read very often. And she did it very well. The mystifying air was maintained through out the book. This is a writer who truly knows her craft. She is someone to watch. A couple of quotes to whet your appetite a little more. As you can see all that happens in the first 25 pages. This style of writing continues until the final page. There is a sequel coming out to The Darkness! YAY! I knew there had to be. On Amazon her book is available for the Kindle and in print. She has a blog. It is at http://wordsmithcrystalconnor.blogspot.com/ I stopped by there and joined it. It is an awesome site. Check it out. So peeps if you like a good scary story that blurs the line of reality and fantasy this book is one you will regret if you do not read. Pick it up today. Really you won't be sorry. You'll be scared but not sorry. Please leave your comments. I love talking books with you!